It promises to be a beautiful, white christmas, here, this year. The mornings are beautiful with the soft, white light in the mornings and evenings sparkling with necklaces of tiny, yellow lights dancing in the wind. Have you noticed when it snows, that it is lighter and brighter than you would normally expect with such a weak and watery sun? Its the light reflecting and bouncing off the snow on the ground, bushes and low roofs (that is normally absorbed) that makes it look like there is more light than there actually is. The three primary colors mixed so that they are equally dominant gives a grey. Equal dominance is not the same as equal quantity; ruby red, cobalt blue tone and hansa yellow medium mixed in equal quantities will not give a grey, it will give only a dull red since the red in this instance is much stronger than the blue or yellow. Usually you will need more of the yellow to yield a grey but here you need more of both the blue and yellow. Once you have made a true grey, you will notice that it looks rather boring and you wont find the true grey so much in shadows anyway (except in shadows cast by black objects). So instead of making them equally dominant, shift the mixture so that you have one or two dominant. Having the blue dominate gives a blue-grey; having the yellow and blue dominate gives a green-grey; having the red and blue dominate gives a violet-grey etc. Having these colors in shadows makes the subject much more alive. This is especially true when painting whites. Keep all the layers for the bud very light and soften the edges. I`ve also used a bit of cerulean blue for the green areas. The petals marked 1,2 and 3 below have pure white or pale yellow highlights. This makes them look as though they are sitting on top of the other petals which are in shadow and whose highlights should not be as bright as the ones on top so as to give that three-dimensional look. This leaf catches the light and is the most yellow-green of all the leaves in the painting. Paint the first layers with yellow and blue. Mix a yellow-green for this step with just a hint of blue. While the wash is still damp, stroke in the veins with red-violet and violet mixes. The veins should gently flare into the wash while still keeping their shape. 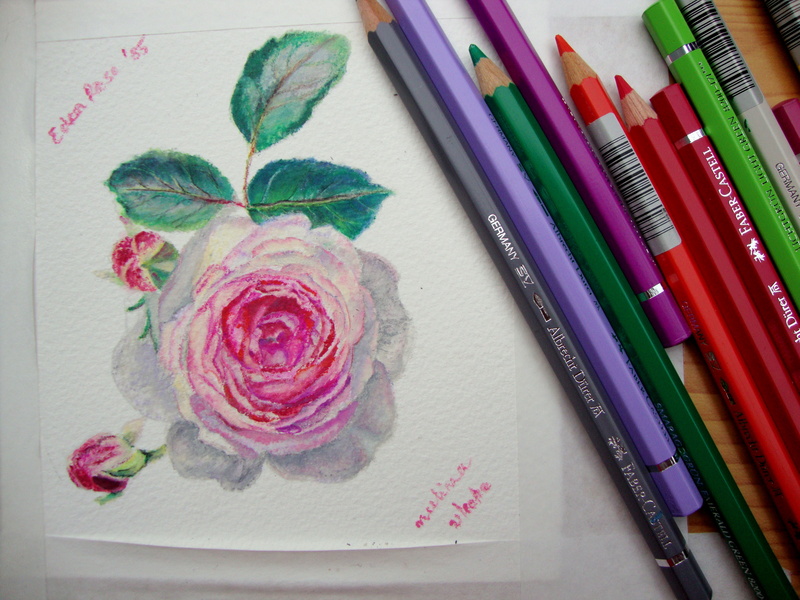 I just did this rose as a quick study to test my new watercolor pencils. Its based on a photo from a book about roses by Andreas Barlage. I love the by-line of his book, the sentiment for this love of roses is so simply put: Ohne Rosen geht es nicht! There is no literal translation to it in English but its meaning lies somewhere between Can`t do without roses and Doesn`t work without roses. 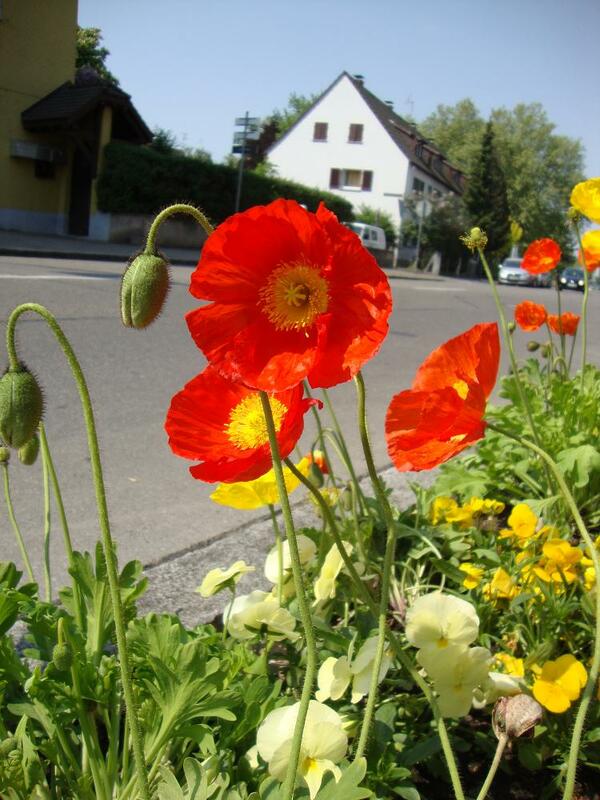 This is what I love most in Germans, their love and care for plants and flowers and the pride they take in their gardens. One can see even very elderly persons pruning or weeding or generally busying about in their gardens on a warm Sommer Nachmittag. The next best thing I like about them is their sense of order. Who doesn`t marvel at their public transport system running like clockwork to the exact minute, one can probably even say second. When I was new here, I used to find it slightly amusing that they would start wearing perplexed frowns and generally fidget about if the clocked ticked to the next minute and the tram hadn`t arrived by then. Now ofcourse, after many years of living here, I too fidget about as I wait for the message announcing why and how long the Verspätung is. I think I`ve taken to this place like a duck to water. The Faber Castell Albrecht Dürer line is made in Germany and they come with their own individual lightfastness ratings, something which is difficult to get hold of in colored pencils, so you can choose the colors which have the highest ratings. The watercolor pencils are soft and have intense chroma and you can work with them either dry or wet. I thought it would be fun to try them because you get more control with pencils. Also to an extent you can layer light on dark, so you don`t need that kind of discipline that regular watercolors require in that you have to get it right the first time. Just lay down strokes and blend different colors. Also, you can take a white or light colored pencil and go over the entire area softly smudging it. This will give an evenly blended area with a smooth finish, a dry technique called burnishing. Layer on darker colors if needed and repeat the burnishing. For the wet techniques, lay down strokes that follow the shape of the form you are trying to create, and gently go over it with damp brush to even out the layer (but you can still keep distinguishing marks). You can also dampen the paper first and then lay down the strokes which gives a different effect. Or dip the tip of the pencil (don`t dip the wooden casing!) in water and then lay down strokes. 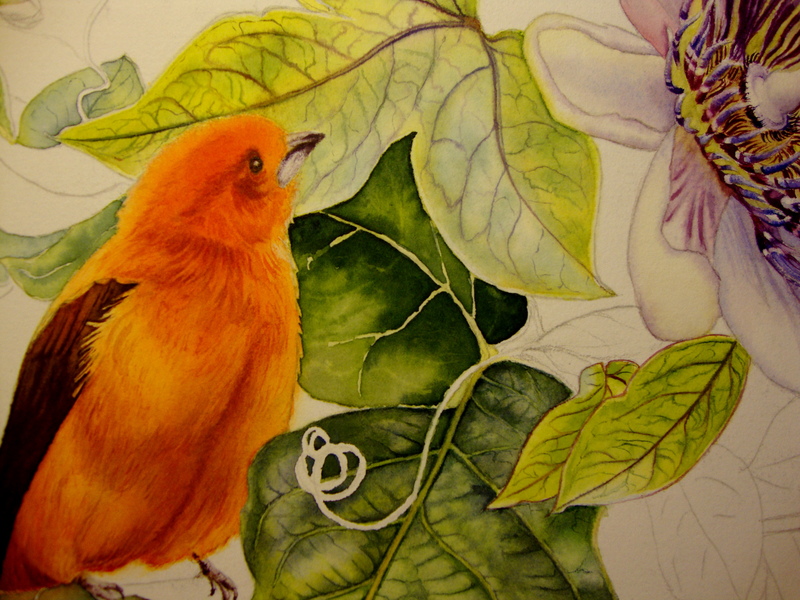 They can be combined with their polychromos colored pencils for mixed media work. Their range is color coded in different media so that you can combine them and not worry about colors standing out awkardly. Lots of exciting possiblities! Glazing: Glazing is a technique where you paint washes of color over already dried washes to change the overall color of the wash. This is primarily used to slowly build up form, one layer at a time. In this sample, a pathlo blue wash was painted and allowd to dry completely. It is very important that it be dried completely, otherwise when you paint the second layer, this first wash will lift creating unwanted splotches. On top of that, brilliant purple has been painted (see shade in the ‘lifting with damp brush section’), the blue and the pink combine visually to make a violet. A green gold (yellowish) has been glazed below that. It shows as a dull green. Lifting with damp brush: Some pigments are more staining than others, meaning that they are more difficult to remove once they have been painted. Here, I have chosen Schminke’s brilliant purple (which is fugitive, so I donot use it much) because it is non staining and lifts readily. 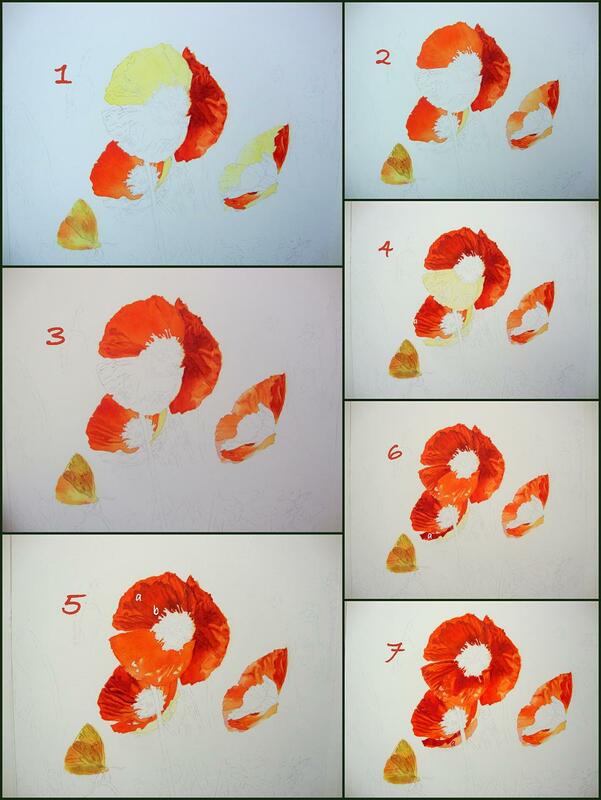 Paint a swatch of color and let it dry completely. Now take an old stiff brush which is slightly damp. Drag a line on the paint swatch. Blot on a tissue to remove the color which has deposited on the brush and repeat this again and again till you have lifted the color. Lifting is useful for correcting mistakes, painting veins on leaves etc. 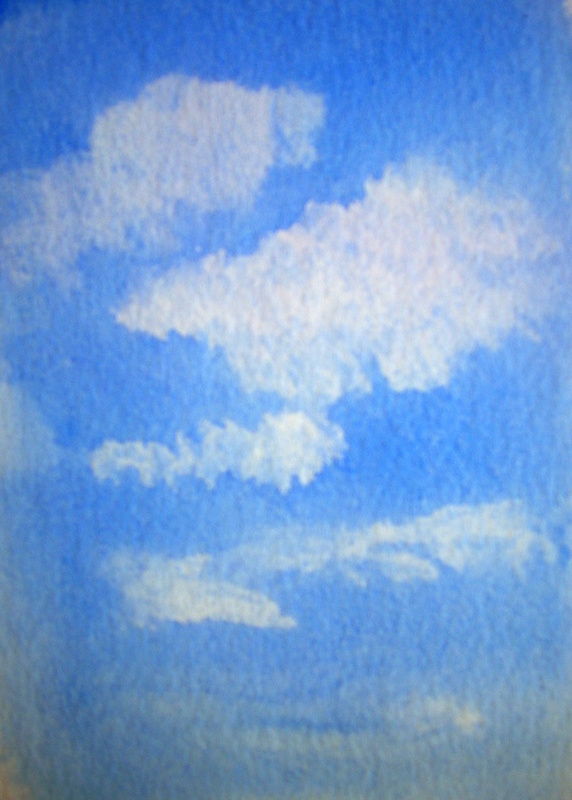 Lifting with damp or dry tissue: Paint a blue wash of sky of medium intensity. Before this has a chance to dry, lift patches of the blue with a damp or dry soft tissue to resemble clouds. Lifting with a dry tissue gives hard edges. Combining both methods gives a realistic look. Keep rotating the tissue so that the blue which you had lifted does not get pressed back to the paper. If you find that the paper is drying too fast before you have had a chance to do the lifting, wet the paper first evenly. Just as the sheen is starting to go, brush in the blue color. Wait for a second or two for the moisture to be absorbed. Now start lifting the clouds. Salt technique: Paint a small swatch of a basic wash. The timing for this has to be just right. Take some table salt and sprinkle randomly on the wash, just as the sheen is going away. Donot disturb it, till it is completely dry. After it has dried, brush away the salt gently. This reveals a nice random pattern which can be used as textures for stones and rocks or for snow flakes. You will not get this effect if you sprinkle on a wet wash or wait too long before sprinkling. Experiment with larger salt crystals and see what textures they show. Splattering: Snow flakes can also be simulated by splattering white gouche on a gray-blue sky. Take an old tooth brush and load it with white paint. With the handle of a brush or by using your hand, scrape the bristles of the toothbrush with quick strokes moving it around the paper. You will get a pattern of off white dots on the gray sky. 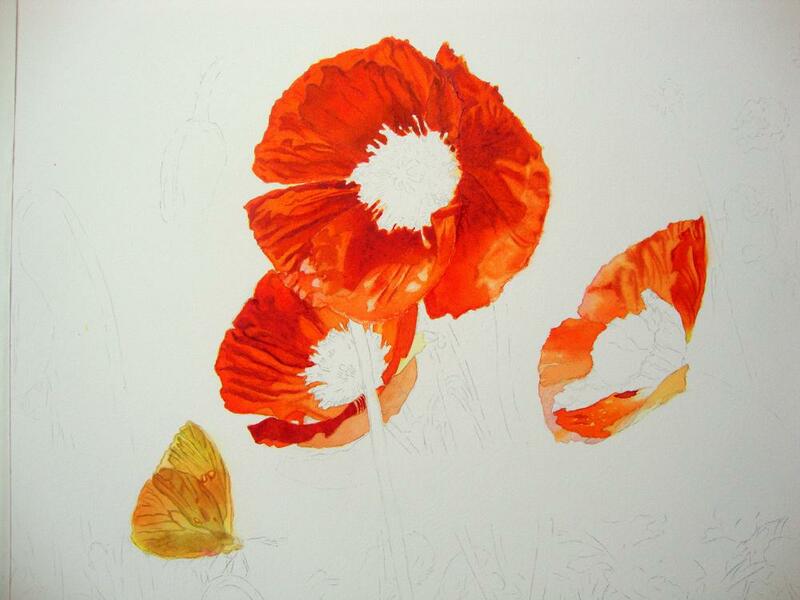 Take care not to mix the opaque gouche with your transparent watercolors as it will make them dull. Splattering can also be done with different watercolors to give an interesting design to an otherwise boring large area in your painting.